Posted on 21, October 2016 by EuropaWire PR Editors | This entry was posted in Automotive, Czech Republic, Industrial, Transportation & Logistics and tagged KODIAQ, Kvasiny plant, large SUV model, Michael Oeljeklaus, ŠKODA. Bookmark the permalink. 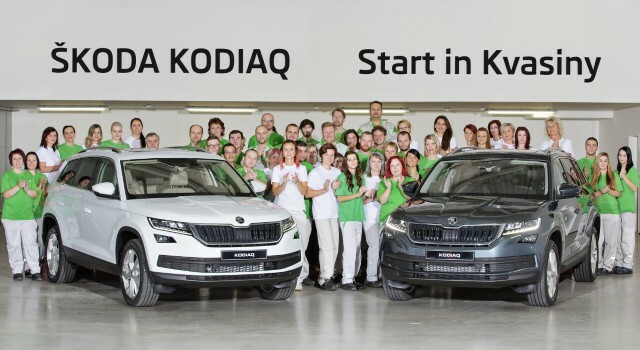 Mladá Boleslav/Kvasiny, 21-Oct-2016 — /EuropaWire/ — Launch of the ŠKODA KODIAQ: The series production of ŠKODA’s new large SUV model was launched today at the Czech plant in Kvasiny. The brand is strengthening its position in the world’s fastest growing market segment with the ŠKODA KODIAQ. From February 2017, ŠKODA’s latest model will be showcasing all the brand’s strengths: with a distinctive design and an exceptional amount of space, with practical intelligence and innovative technologies that would usually only be found in higher vehicle classes. Orders can now be placed for the new SUV in many markets. The manufacturing facilities in Kvasiny have been extensively modernized and expanded for the production of the Czech automobile manufacturer’s latest models. In addition to the newly commissioned car body construction and the conversion of the assembly line, the paint shop and logistics areas have also been expanded. Kvasiny is one of ŠKODA’s three production sites in the Czech Republic. Approximately 5900 people are currently employed there, making the plant one of the largest industrial employers in the Hradec Králové region. The plant is currently undergoing the most extensive modernization and expansion in its history. Over the next few years, the production capacity of the East Bohemian site will increase to 280,000 vehicles annually. In this context, ŠKODA will be creating jobs for around 2000 specialists and investing some 7.2 billion Czech crowns into the expansion of the Kvasiny plant by 2018. Besides the ŠKODA KODIAQ, the ŠKODA models SUPERB and YETI currently run off the production lines at the Kvasiny site. In 2015, around 142,000 ŠKODA vehicles were produced here. The automobile plant was founded 82 years ago.